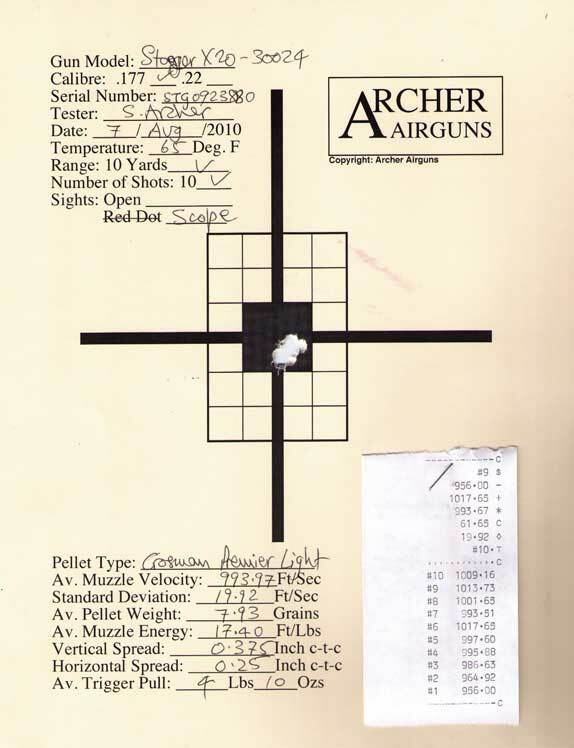 Here's the Archer Airguns Gold Service test target for a Stoeger X20 combo that I shot today. As with the X50 test target posted previously, this 10-shot group shows that these are accurate air rifles! The gun was still dieseling a little at the time of the test. This means that muzzle velocity will probably settle-out to the 910 - 930fps range that's typical for Stoeger X10 and X20 air rifles after 40 or 50 shots. That's around 14.5 to 15.25 ft/lbs muzzle energy - a very handy figure for hunting small critters. Although the muzzle velocity will drop slightly as the gun "dries out" (of course this applies to all spring piston air rifles, not just Stoeger models), the standard deviation - shot to shot difference in muzzle velocity - will probably also improve to the normal 7 - 8 fps standard deviation level over 10 shots for X10 and X20 guns. And that will further improve accuracy! The Archer Airguns Summer Sale Starts Today!